Arsenal in the summer: 1938. The Nazi salute; the world record signing. 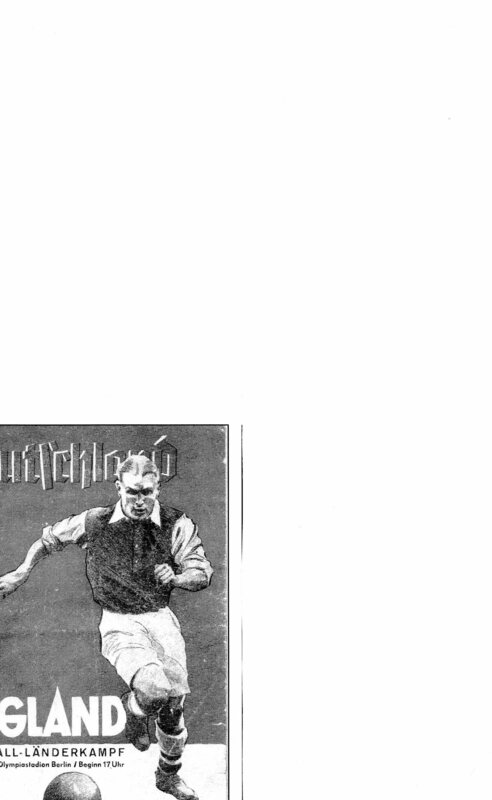 After winning the league and playing their one friendly match (see the article on April and May 1938) Arsenal’s season was over. However there was, as always, other activity for the Arsenal players and the club during the summer. They may even have indulged in going to the races. 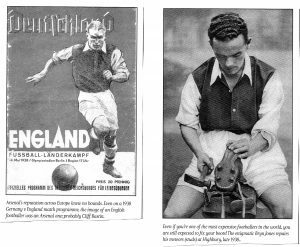 On 14 May 1938 England played an international against Germany in Berlin which England won 6-3, Hapgood and Bastin being Arsenal’s players in the game, and Tom Whittaker the trainer. In front of 105,000 people Cliff Bastin England volleyed a rebound after Jakob saved a Goulden shot on 16 minutes for the opening goal. The match is particularly remembered for the fact that Sir Neville Henderson, the British Ambassador in Germany, had advised Stanley Rous, the FA Secretary that the England team should give the Nazi salute for the betterment of Anglo-German relations after it became clear that the German team had been ordered to respect the English national anthem. The match was attended by Hermann Goering, Rudolf Hess and Joseph Goebbels but not Adolf Hitler, who was expected, but did not attend. According to reports, in these days the England team, played without any special training sessions. 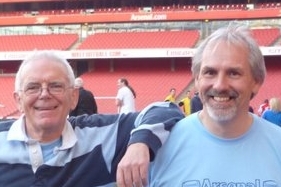 The score was something as a surprise as this was a fairly inexperienced English team with only the Arsenal players in the side having made more than 10 international appearances. Finally on 26 May 1938 both Ted Drake (2)and Cliff Bastin (1) scored in their final England appearance which ended England 4 France 2. Ted Drake’s two goals made it six goals in five England games. 1 June saw the arrival in service of the Bren light machine gun in the British Army – perhaps not widely noted at the time but certainly noted significantly within a year. And on 9 July again as a sign of things to come, gas masks were issued to the population at large. On a lighter note however on 30 July the first edition of the Beano comic went on sale while those who liked slightly more serious matters would have been eagerly reading the new summer publications including “Brighton Rock” (Graham Greene), “Scoop” (Evelyn Waugh) and the hit novel of the year “The Code of the Woosters” by PG Wodehouse. Back with football on 4 August 1938 George Allison broke the UK transfer record signing Bryn Jones from arch-rivals of the season just gone, Wolverhampton for £14,000. Sadly the publicity this brought seemed to play on Bryn Jones’ mind and he did not reach heights expected in his first season. However many is the player who has developed considerably in his second season but for Jones it was not to be, as the war removed most of his career. (See also here). On the left above is the cover of the programme for the Germany v England match showing Cliff Bastin as a the symbol of England, on the right Bryn Jones having signed for Arsenal for a world record fee, but still having to undertake the delicate manipulations of his boots, with a hammer. These pictures come from “Too dearly loved to be forgotten.” Full details of this remarkable book and details of how to obtain it are included in the Untold-Arsenal review here. 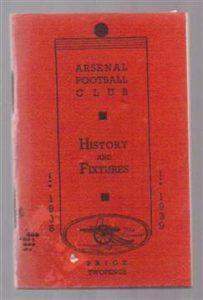 We believe there was an Arsenal vs Arsenal Reserves match on 13 August at Highbury, but no record of the score is available. And for the next week Great Britain and the United States contest the inaugural Amateur World Series in baseball, played in the north of England. Britain won every match. Of course the Cheltenham bonus wasn’t available them but if it had been (as it is now) there would have been some great odds. The first league match of the season was played the following saturday, on 27 August where the Arsenal handbook 1938/9 was on sale. Here’s the cover. Design perhaps was not the club’s strong point.